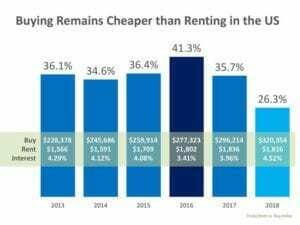 On average buying Is Now 26.3% Cheaper Than Renting in the US. 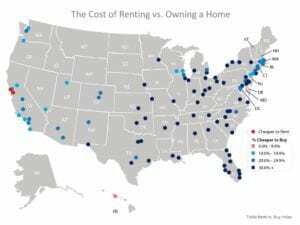 24 Aug On average buying Is Now 26.3% Cheaper Than Renting in the US. The results of the latest Rent vs. Buy Report from Trulia show that homeownership remains cheaper than renting, with a traditional 30-year fixed rate mortgage, in 98 of the 100 largest metro areas in the United States. The Twin Cities of Minnesota is more affordable to own and more cheaper than renting than most other major metropolitan areas.